If you have suffered frequent bouts of allergies of late and it has nothing to do with your eating habits or any underlying medical condition, then there is a likelihood that you have fallen prey to the allergy causing dust mites! 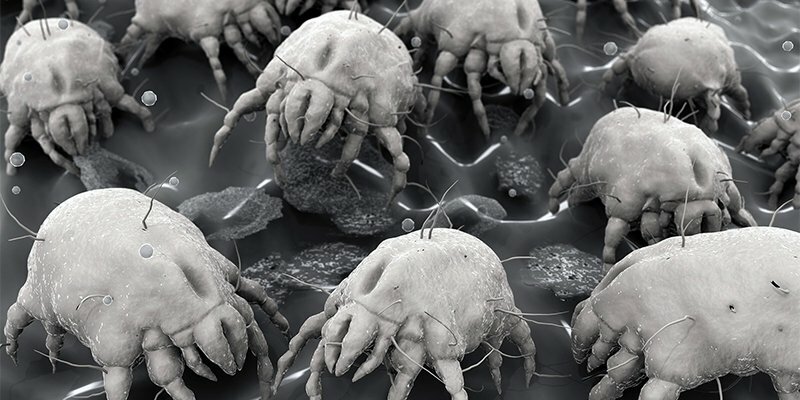 One of the universal causes of dust allergy, the presence of dust mites at home is a common phenomenon – and a stubborn one at that – since the dust mites flourish in human habitation and it is quite an arduous task to eliminate them completely from our dwellings despite undertaking adequate measures. Dust mites are rare in locales with a cold climate as they thrive best when the relative humidity of their environs is significantly higher. This explains why Singapore’s indoor air quality is conducive to their survival – its tropical climate is characterised by year-round warm weather and frequent shower spells. So, what are these dust mites and what can we do to safeguard ourselves from their ill effects even if we are unable to do away with them completely? Let’s find out. Dust mites, also known as house dust mites, are tiny creatures that belong to the Pyroglyphidae family of mites. They measure about a quarter of a millimetre in length and are quite imperceptible to the naked eye. Dust mites have an affinity for human dwellings and they feed on dead skin cells shed by humans and pets. While the male mite has a life cycle of about 10 to 19 days, the female dust mite enjoys a longer life span of up to 70 days once she has mated. During this time, she has the capability to produce a whopping number of 100 eggs. Consequently, dust mites are able to propagate rapidly if they are exposed to dust, clutter, humidity and other conditions that are beneficial for their growth and reproduction. Is It Common To Come Across Dust Mites At Home And At Work? Globally, there is hardly any home that has not had dust mites at some point or other. And neither can one claim confidently that he or she is fully protected from the perils of dust mites at work. With increasing pollution levels and excessive dependence on man-made cooling units and chemically produced synthetic substances, pure indoor air quality is fast becoming a rarity and accumulation of dust is a common sight in most households and offices. The pile of dust, in turn, harbours several types of allergens, dust mites being one of them. Moreover, these allergy causing creatures take well to a humid environment and prefer moisture-laden areas such as carpeted corners, upholstered furniture, heavy drapes, quilts, mattresses and woollen blankets. Dust traps like clothes and soft toys are also conducive for their survival and breeding. An interesting point to note here is that apart from their natural occurrence in offices, dust mites are also transmitted to our office environs passively, especially when a few of the mites or their eggs have made their way to our clothes and we end up donning these mite-infected clothes to our offices. Other than this, the constant foot traffic at our workplace is also instrumental in the spread of dust mites at work. How Do Dust Mites Induce Allergy? House dust mites are not parasitic in nature and do not exhibit the ability to burrow themselves under our skin. Contrary to popular belief, it is not really the dust mite itself that causes the allergies in humans but it is the presence of proteins in their faeces that is the reason behind the spurt in allergies. It is estimated that the average dust mite produces approximately 2,000 faecal particles during its 10-week life span and around 20 waste droppings are excreted by it every day. These waste droppings or faeces contain potent digestive enzymes that trigger wheezing, sneezing, rashes, watery eyes, runny nose and other allergic reactions. Even after the dust mite dies a natural death, their leftover droppings continue to trigger and aggravate allergic symptoms. Likewise, when the dust mite sheds its outer covering called the exoskeleton, the latter is capable of triggering a host of other allergies. An interesting point to note here is that one gram of dust can contain as many as 1000 dust mites and 250,000 faecal pellets – enough to induce a host of allergies in those who are allergen-sensitive. It is a known fact that poor indoor air quality is a key contributor to a plethora of medical conditions and diseases. Often, dust and other indoor air pollutants do not remain confined to the surfaces of our homes and offices but also float in the indoor air whenever they are stirred up due to dusting, sweeping, vacuuming, walking etc. When we breathe in these harmful allergens, they cause allergic reactions in various parts of our body which include inflammation of our respiratory tract, nose and skin. Long-term exposure to dust and dust mites can lead to a spurt in debilitating diseases such as asthma, allergic rhinitis and eczema. Asthma, in particular, is a long-term disease of the airways in the lungs that has no permanent cure. The disease is characterised by sporadic episodes of wheezing, coughing, shortness of breath and tightening of the chest – symptoms which may worsen at certain times of the day and may be moderated by taking medication and avoiding irritants that further aggravate the condition. Those with allergic rhinitis and eczema often encounter a dip in their productivity and concentration ability as their perennial stuffy nose, teary eyes and itchy skin make it difficult for them to focus on their activities effectively. While it is near impossible to remove dust mites from our surroundings completely, one can still implement necessary steps to keep them in check and minimise their adverse effects. First and foremost, it is important to monitor the presence of allergens that exist in your indoor environment so that you can take remediation steps proactively. Renowned indoor air quality testing companies such as IAQ Consultants use a dust mite checker to assess and ascertain the indoor air quality in Singapore and apprise their customers within 10 days about possible indoor air contamination in the event that any harmful allergen is detected in the indoor air at a level that exceeds healthy limits. Apart from using a dust mite checker, you can also incorporate the simple practices mentioned below to protect you and those around you from the long-standing and undesirable effects of dust mites. The above recommendations need to be executed diligently for you to effectively control the problem of dust mites and the adverse health effects they cause in your homes and offices. Should you suffer from allergies which do not subside even after these measures are taken, you should seek expert medical advice. An allergy test can easily prove whether you are allergic to dust mites or something else within your indoor environment. Interested in our Mold Testing Services? For a free consultation, call us now at 6245 0109.